Kanye West and Kim Kardashian's surrogate is reportedly pregnant. 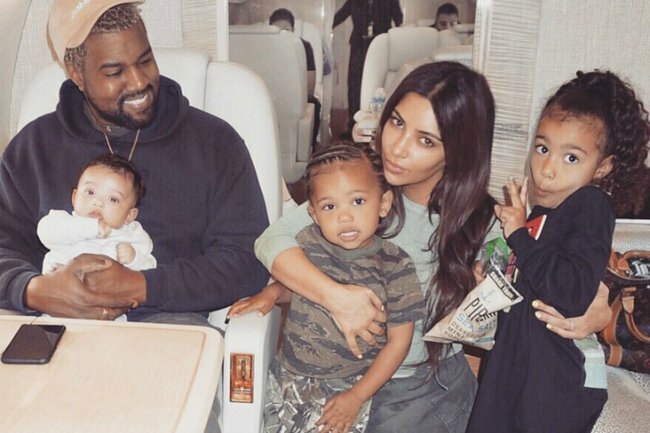 Kim Kardashian and Kanye West are reportedly expecting their fourth child via surrogate. Kim Kardashian and Kanye West are expecting their fourth child together, according to Us Weekly magazine. The publication reports that multiple sources have told them the rapper and entrepreneur will welcome their fourth child “in very early May” via surrogate. This would make their surrogate already five months pregnant. The magazine is also reporting the baby’s gender – a boy. Kim, 38, and Kanye, 41, welcomed their third child, Chicago, via a surrogate in January last year after Kim experienced complications during her first two pregnancies, including preeclampsia. “Doctors said that it wasn’t safe for my — or the baby’s — health to carry on my own,” the reality star wrote on her website in January shortly after Chicago’s birth. The married couple also share daughter North, five, and Saint, three. But apparently, like she was a part of growing up before her mum Kris Jenner remarried, Kim “always wanted” four kids. US Weekly reported the couple had an embryo left over from their attempt at surrogacy with Chicago and have now decided to use it.